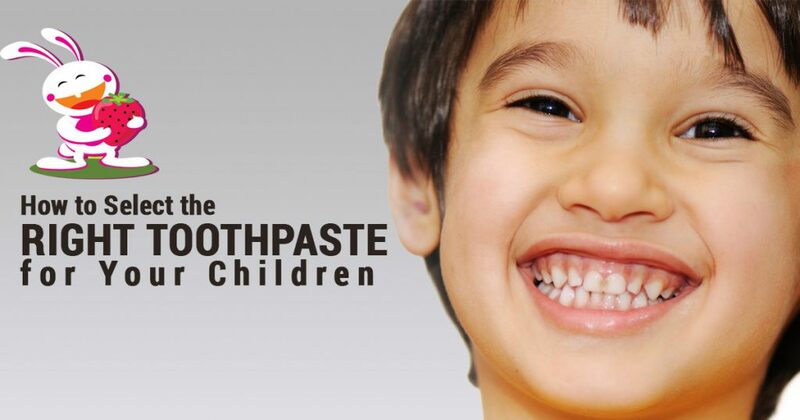 How to Select the Right Toothpaste for Your Children? As you welcome your little one into your family, there are a million things to take care of! It is a very exciting time for any parent. You’d want to do everything you can to ensure that your child is healthy and grows strong. And the same goes for caring for his or her newly-sprouted pearly whites! For most babies, the first tooth appears by the time they are 6 months old. And at around the 3-year mark, they have 20 baby teeth. Unfortunately, baby teeth are at the risk for decay as soon as they erupt. This means that without proper care, your baby will develop dental caries. Toothpastes are products that contain fluoride, anti-bacterial agents, and mild abrasives that help prevent tooth decay and keep the teeth healthy. Each of these ingredients have a specific role to play. Anti-bacterial agents inhibit the growth of bacteria, and help reduce plaque and gingivitis. Abrasives are constituents such as magnesium carbonate, hydrated aluminum oxides and calcium carbonate that make the mechanical action of brushing more effective. Fluoride helps in strengthening tooth enamel and preventing tooth decay. But, toothpastes for adults and children vary in their fluoride content. You need to look at the toothpaste’s packaging to check the amount of fluoride it contains. Most regular toothpastes contain 1000-1500 ppm of fluoride. Children up to the age of 2 tend to swallow their toothpaste, which is harmful as ingesting fluoride can cause sickness. Hence, always pick a toothpaste that is designed for children and has fluoride content not more than 1000 ppm. You should consult your dentist to find out if your child needs a fluoridated toothpaste. Also, potable water contains a small amount of fluoride, which is the most important component in a toothpaste for preventing cavities. Usually, children below the age of 2 get enough fluoride from tap water alone and do not need a fluoride toothpaste. However, if your dentist thinks that your little one needs more fluoride, he will recommend a toothpaste for kids. Moreover, if your child has a habit of swallowing the toothpaste, then using one without fluoride is a better choice. You can teach him or her not to swallow and once they are accustomed to brushing, switch to a fluoridated toothpaste. Mint is the most popular flavour for oral products throughout the world. However, when it comes to children, they prefer fruity flavours like strawberry or watermelon. In fact, many children don’t like brushing because they don’t like the taste of regular toothpastes. Although, you may have to try a few flavours to find one that that fancies your child’s taste buds. Funny cartoon characters on the packaging can also encourage your child to enjoy brushing and promote good oral hygiene. To ensure complete safety of a product, always check if it has necessary government certification. If you have any concerns regarding a toothpaste, consult your dentist. He or she will tell you whether to use the toothpaste or not. Also, not all kids are patient enough to brush for full 2 minutes. So, try making brushing time exciting by singing a song or narrating a fun story. ICPA’s Kids Bunny Toothpaste satisfies all of the above criteria. It has a child-friendly strawberry-mint flavour, which your children will enjoy brushing with. The fluoride content in Kids Bunny is 500 ppm to maintain your child’s strong and decay-free teeth. You may be used to squeezing out enough toothpaste to cover the surface of your brush. But, children have small teeth and hence, need only a little. Moreover, smaller quantity minimizes the fluoride intake. For children under 2, simply smear the toothpaste or use an amount the size of a rice grain. For children between 3-6 years of age, use a pea-sized amount to brush their teeth. Cleaning your baby’s mouth is important even when your baby doesn’t have any teeth. Baby teeth start developing from the second trimester itself so taking care of them early on is a wise choice. You can start by wiping the gums with a clean and moist washcloth or gauze pad. This will not only clean your baby’s mouth but also get him or her used to brushing. Get a Fun Toothbrush Too! The best way to get children do something mundane is by making it fun. Most children dislike brushing but if it becomes another part of their playtime routine, they will look forward to it. Getting character-based brushes like Kids Dyny to complement a kid’s toothpaste is a great way to engage children to brush and maintain oral hygiene. Keep the above-mentioned things in mind and ensure a bright smile for your little bundle of joy. Also, ICPA’s range of dental care products including Kids bunny Gel and Kids Dyny Tooth Brush are now available to buy on amazon.in. So, shop for dental care products for you and your family and maintain a healthy, beautiful smile that will last a lifetime!